By June of this year, Iraqi Kurdistan was producing 360,000 barrels per day — about 10 percent of Iraq’s production (and about 0.5 percent of the world’s supply). And much more was expected. In a 2009 State Department cable leaked by Wikileaks, one foreign firm said Kurdistan “has the potential to be a world-class hydrocarbon region.” Yet ISIS posed a (partial) threat to that boom when they showed up on the outskirts of Erbil, a city of 1.5 million that is hosting many of the oil and gas firms in the Kurdish region. 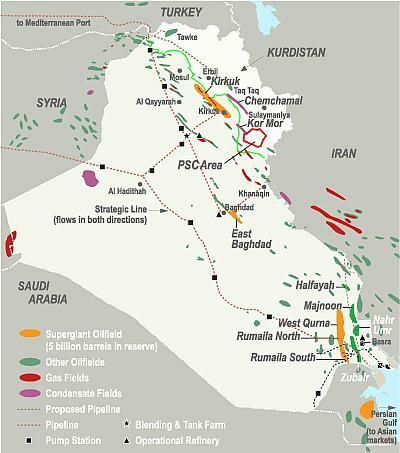 On August 8, Reuters reported that some 5,000 barrels per day had gone offline in Kurdistan as a result of the fighting. Various oil firms, including Chevron, said they would withdraw some non-essential personnel from the region. So far, the disruptions have been relatively minor, particularly since the US has launched airstrikes against ISIS that allowed the Kurdish military to retake a number of towns. The Kurdish regional government now insists that “oil production in the region remains unaffected.” ISIS, for its part, clearly has an interest in seizing oil fields. The group reportedly controls seven oil fields and two refineries in northern Iraq, as well as a portion of a pipeline running from Kirkuk to the port city of Ceyhan in Turkey. Reports have suggested that ISIS is now selling some 10,000 barrels of oil per day to fund its activities. The first is that the Obama administration has steadfastly discouraged ExxonMobil, Chevron and the other companies from working in Kurdistan. Until recently, it sought to sabotage the region’s efforts to export its oil. The White House’s rationale has been that, to the degree Kurdistan gains de facto financial independence from Baghdad, the less likely that Iraq will hold together as a country. On Twitter, Middle East energy expert Robin Mills has been among those pushing against the it’s-about-oil theory. A second problem is Obama himself—he is fixated on renewable energy and opposed to oil. When he has embraced oil, such as shale, Obama has done so reluctantly and often in order to placate the fossil fuels industry and its advocates. There may be rational speculation surrounding the role of oil in former George W. Bush’s original assault on Iraq, but there is little likelihood that it featured on Obama’s list of reasons to bomb ISIL. It seems likely that the decades of U.S. involvement and the vast web of American relationships in the region—both of which have a great deal to do with oil—play a role in making Americans more viscerally concerned with the region and its people. In that sense, our humanitarian impulse in this conflict is quite likely connected to oil, albeit in a distant and complex way. But that is a long chain and a nuanced argument, to which the “Obama is worried about the world’s oil supply” thesis bears very little resemblance. So where does this conviction come from? Perhaps it’s cynicism borne of past experience: Oil has played a major role in Western interventions in the Middle East, often with disastrous results. But we shouldn’t assume that every statesman is Henry Kissinger or every action is a new Suez operation. The colonialist paradigm is a useful lens for historians, but when it becomes an ideological commitment for the political commenter, it’s simply another set of blinders. Schwartz gets it exactly right here. Nobody doubts that petroleum, its ubiquity in the modern economy, and our dependence on it factor heavily into American foreign policy; it is, after all, the only reason we’ve been allied for 70 years with the Saudis, a regime whose values, interests, and activities contradict our own at every turn. It’s right and necessary to acknowledge how damaging petro-politics can be and to worry about our government being beholden to the whims of despotic rentier states. I’m not a huge Thomas Friedman fan, but he’s right to harp on this point as he has done periodically for years. But the presence of oil interests in Iraq does not ipso facto preclude the possibility that American policy there might also be guided by something else. I used to buy into the theory that the 2003 Iraq invasion was about oil, and as LeVine mentions, it was likely part of the equation, but then so were the domestic politics of the War on Terror and a settling of scores between the Bush family and Saddam Hussein. A conspiracy-minded focus on any of these drivers obscures the key fact that the war was driven by an ideology – the neoconservative theory that democracy can be exported by force – that is dangerous in and of itself and whose promulgators have yet to exit the public sphere despite having been pretty conclusively proven wrong. So by all means, let’s talk about the oil, but let’s not mislead ourselves that it’s all about oil. Mosul is not the only dam for which IS has fought. After taking large parts of Iraq in a campaign that started in Mosul, the country’s second largest city, in June, on August 1st IS battled to take control of Haditha dam on the Euphrates in the eastern province of al-Anbar. The fighters were repelled by Iraqi troops and Sunni tribes, but reports suggest the offensive continues. IS may want to control these resources in order to bolster its claim to run a state. But it may have additional motives. Baghdad and southern Iraq rely on water being released from these dams. So IS could cut off the water, limiting flows to Baghdad and the south or, conversely, release large amounts that could cause floods (although this would also flood areas controlled by IS, including Mosul city, south of the dam). Any change in water flows would also affect the availability of food, because Iraq is heavily dependent on irrigation to grow wheat, barley, rice, corn and fruit and vegetables. I’m at a loss for why people aren’t freaking out about this a whole lot more. Previous Previous post: Who’s Really Making Marijuana Users ‘Lab Rats’?